I’ve just been picked up as DIT on another feature film starting the first week of June and part of that responsibility includes letting our line producer know how much storage space the film will need and recommending appropriate storage systems and safety protocols for duplicate or triplicate backup. DIT is, well, a lot of IT. Estimating how much storage space a film needs is a delicate, tricky thing. If you’re on a short schedule or a tight budget then estimating too low or high can cause production issues. It has been my experience that I should plan for, on average, 4 hours of footage per 12 hour day per camera for a scripted film and consider that 70% of our storage needs. 4 hours of footage in the can is safely on the high end and the extra headroom for storage covers audio backup, production stills, hard drive performance as it reaches capacity, formatting headroom, and inevitable need to have some additional space to shuffle data around once the footage hits post production. If you’re an iPhone or iPad user then one of the apps I recommend grabbing is KataData which is a data rate calculator for numerous codecs and cameras; it’s an app I’ve been using for over a year. Another option is to look up camera manuals or codec specifications and run calculations manually based on data bitrate. This article on The Black and Blue dives in deeper with some of the math to calculate bitrate per second with RED footage specifically. Lets use an example: We have a 3 day shoot on a RED Epic shooting 4K HD REDCODE 6:1 24fps and we want ProRes HQ 422 dailies. If we assume duplicate backup then we need ~8 TB of data or about 4 ct. 2 TB drives if your production wants stand-alone external hard drives. Needs may differ if the production wants a RAID10 or RAID5. In terms of estimating camera runtime, the same type of calculations can be applied within the context of the memory card size. I recently worked on a Comedy Central special that wanted to film on the RED ONE but needed to record for an hour and a half uninterrupted. 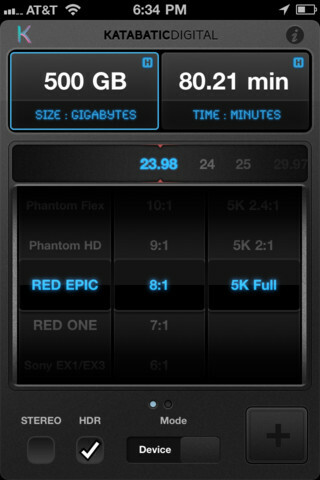 Using KataData, I was able to estimate that the common 320GB RED Drive would fit the bill safely. Filming went on without a single hiccup.